I got a short notice illustration job this week for images for Christmas greetings from Buildopia, an Italian eco-building company. They specialise in wood and their slogan translates as “the building game”. 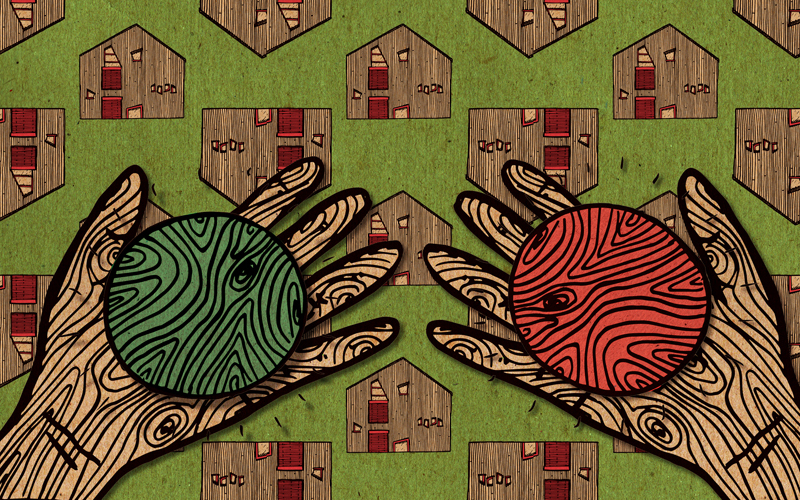 So here’s some wooden hands presenting wooden baubles, on wrapping paper featuring a house they built. The illustration is actually three different line drawings done with Posca marker. The house, the hand and the bauble. (I actually drew another hand with the back of the palm up too, but ended up not using it). I happened to actually already have a drawing of a hand holding a sphere in my sketchbook, which was very useful for reference- you can see it here in some sketches I did of a magician entertaining kids. I scan the ink drawings, clean them up in Photoshop, then import to Illustrator and autotrace and turn into livepaint to make sure they have a completely clean line and transparent background, before being returned to Photoshop for colouring and texture. Each layer is set as a multiply layer on Photoshop, with a texture from some recycled paper I scanned, and extra multiply layers at around 70% opacity for any colours. I then created a repeat pattern of the houses using the offset tool, and laid it down in the background over a green-toned version of the recycled paper texture. Then the items are layered up, with each layer given a drop shadow. The hands are actually copied three times each to give the shadows more depth. So there’s actually about twelve different photoshop layers going on in this illustration.